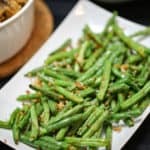 These Roasted Parmesan Green Beans are the most delicious way to enjoy fresh green beans. This simple vegetable recipe makes a great side dish to any meal! Bake for 16-20 minutes or until green beans can be pierced with a fork and crumbs crisp up - stirring half-way.